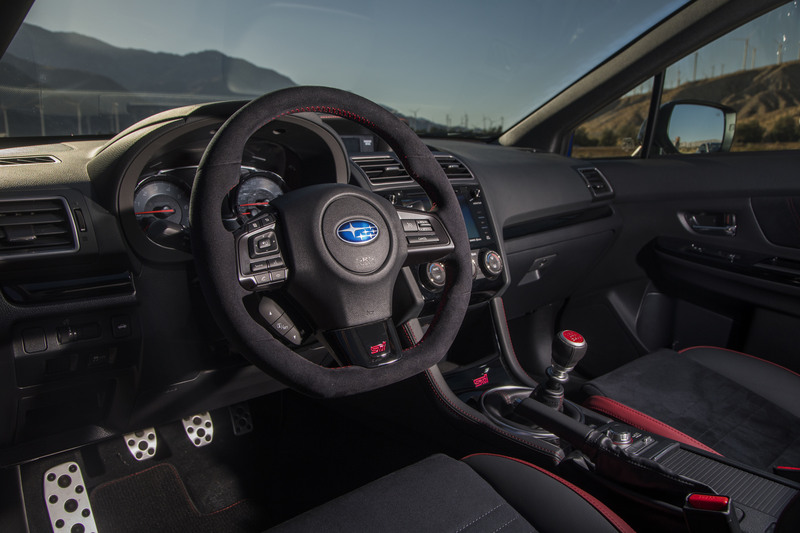 The Subaru WRX STI RA has a perfect steering wheel: hefty, well-proportioned, with a pleasing Ultrasuede grip with just the right amount of squeeze. Hauling that wheel around feels right—correct and inherently joyful. 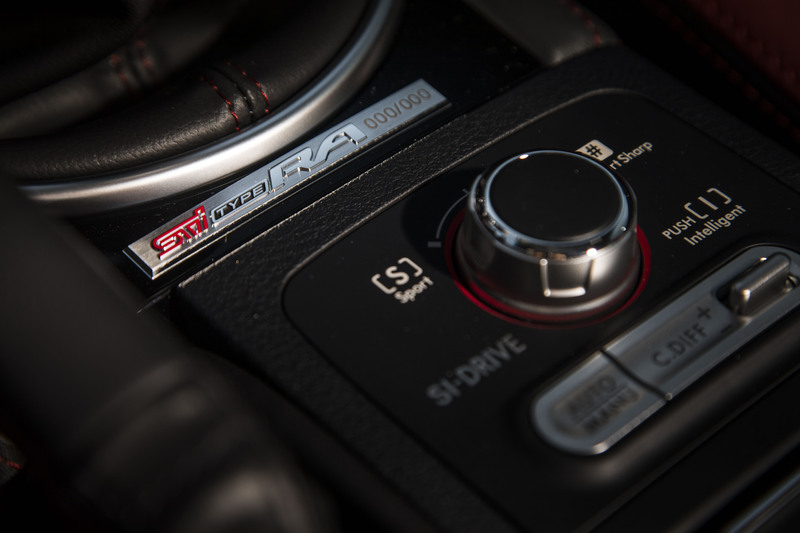 And, knowing Subaru, the company no doubt has a bunch of charts and graphs proving that, yes, from a mathematical standpoint, the steering wheel in the 2018 WRX STI RA is indeed correct, on all counts. Because Subaru, at its core, is a profoundly (if politely) doctrinaire company when it comes to driving dynamics, believing that it has, with its enthusiast vehicles, solved for the various types of Enhanced Dynamic Quality, a.k.a. Driving Pleasure. And, yes, you're welcome to check the math. The WRX STI RA at Thermal Club. JOURNALISTS: "The car could have more power." 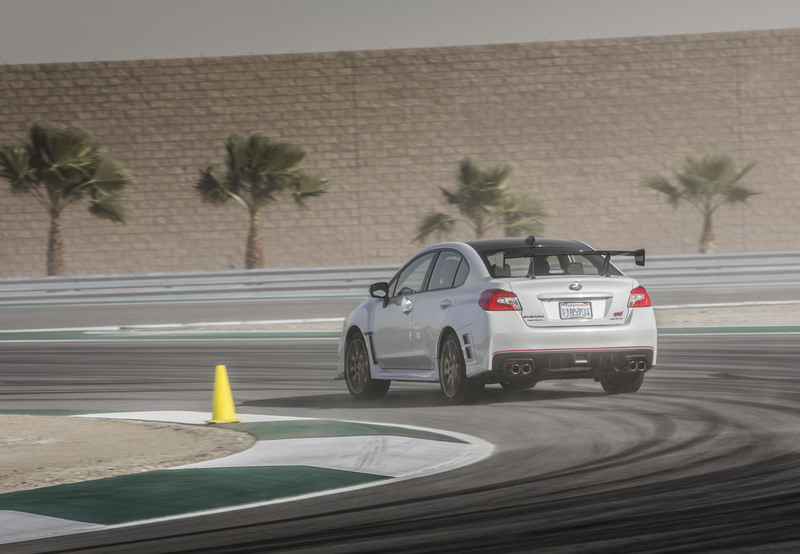 SUBARU: "The car has the exact right amount of power for how it was designed to be driven." JOURNALISTS: "But we want more power." SUBARU: "You don't need more power." Which begs the obvious question: more power, or no? 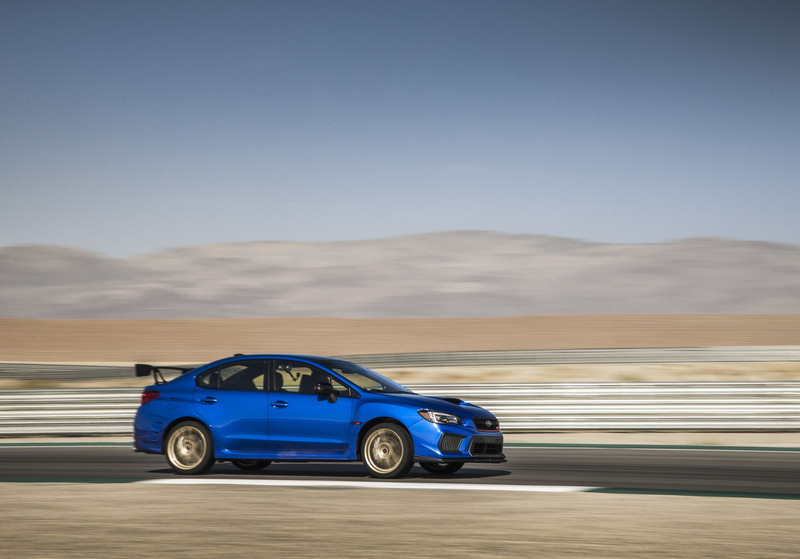 The short answer is that, through the high-speed sweepers and tight hairpins of Thermal's Desert Circuit, the WRX STI RA never felt lacking for punch—and the steering, though ostensibly the same rack and hydraulic motor set-up in the regular STI, feels quicker, somehow. 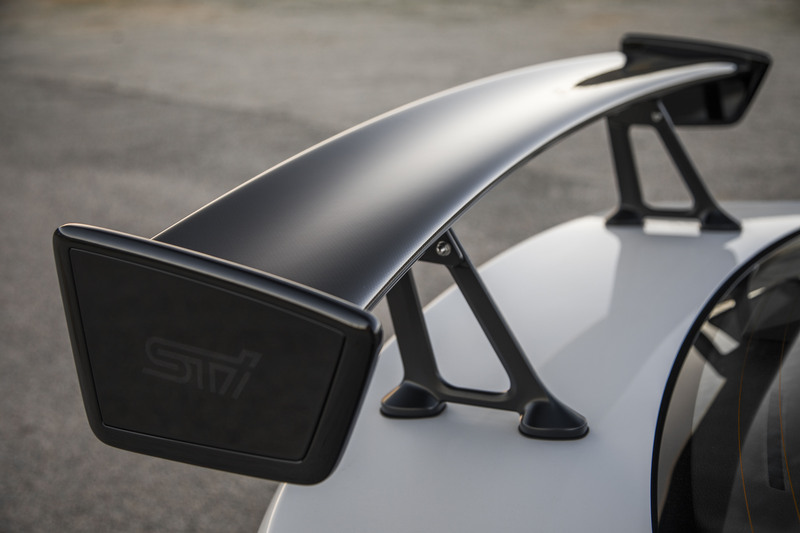 Credit likely goes to the retuned suspension, but another possibility is the new-for-2018 carbon fiber-reinforced plastic (CFRP) roof, which sheds eight pounds, drops the center of gravity by a couple millimeters—and, Subaru claims, stiffens the body to such an extent that the rear tires grip better. Whatever techniques are employed under the metal, it's a neat trick to behold while slaloming through a pair of high-speed esses coming off Thermal's front straight. So despite a five-hp bump and a technically-unchanged torque output, the car feels quicker. 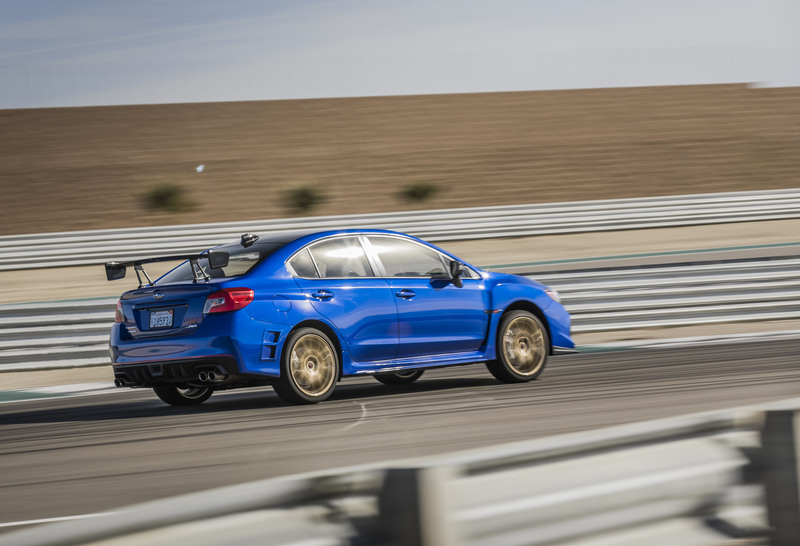 Part of that is no doubt due to the car's improved power-to-weight ratio, with Subaru dropping 68 pounds from the 2018 RA—much of that owing to the decision to chuck the spare wheel, but a rear wing newly made of carbon fiber also helps. A shorter third gear helps, too. 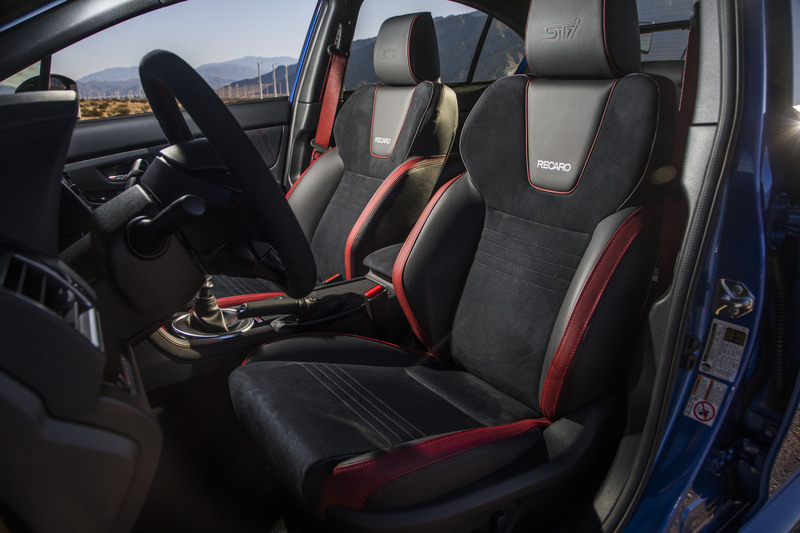 The WRX STI RA also gets Bilstein dampers (a first for U.S.-market cars), a new bumper and a functional, dual-position underbody wing, rear fender cut-outs, and—impacting performance not at all but punching up the aesthetics—Recaro seats and red accents galore both inside and out. 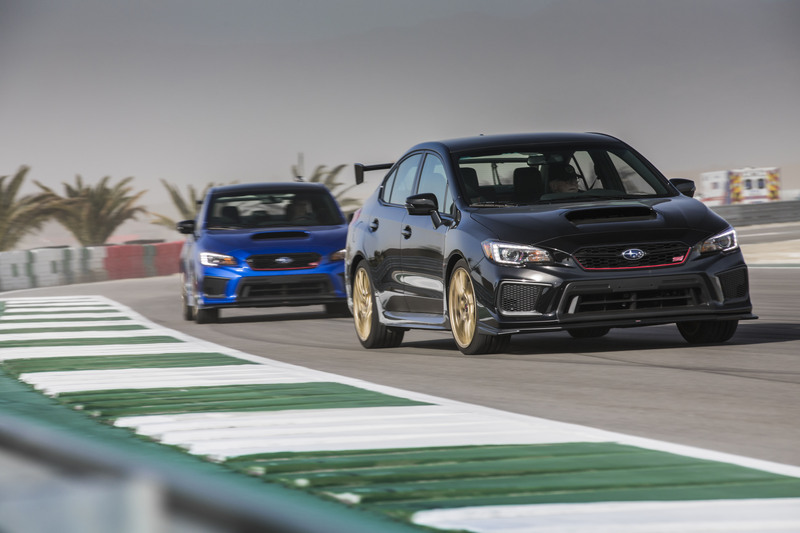 Though peak torque from the turbo boxer is listed at the same 290 pound-feet as the normal STI, there was some confusion during the vehicle briefing as to whether the new car actually did have a bit more twist. The answer seemed to be, "Technically yes, but not enough to warrant mention." The 2018 Subaru WRX STI RA. The "RA" badge stands for "Record Attempt." That's something I've always liked about Subaru: It's a highly technical company that is meticulous about its products; it does not boast lightly; and it's rigorous in ensuring those products adhere to a scrupulous corporate philosophy—even if it's often befuddled on how to communicate the nuance of that philosophy to an American audience that largely thinks more power trumps all other considerations. Subaru could have added that tick more horsepower with an ECU reflash and called it a day; instead, it reengineered the necessary components for added strength and durability. 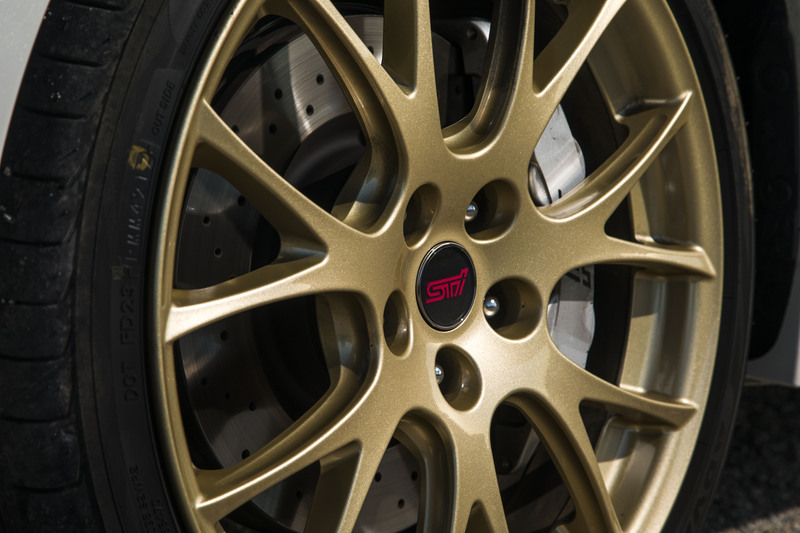 The WRX STI RA has stronger brake pistons (six in front, two in the rear, Brembos now being standard on all STI models), a larger exhaust that reduces back pressure by 50 percent and has sodium-filled valves to better handle the heat, and a redesigned cold-air intake. Subaru seemingly abhors the idea of making things that break, and Things That Don't Break are one of modern life's rare luxuries. That attention to detail does not extend to the interior, however, which can best be described as "Eh, fine." There's great visibility and the Recaros are plenty comfortable even on longer drives, but when a Subaru rep referred to the car's current, unimpressive infotainment interface "the latest and greatest," it could only be taken as sarcasm, or meant as true compared only to Subaru's own previous lackluster efforts in that area. Otherwise, it only served to illustrate how relative the term "latest and greatest" is when one considers the far-superior infotainment offerings from BMW, Tesla, Audi—or a five-year-old Mercedes-Benz. But as always, the true Subaru fan either gets what the company is going for or just doesn't care (not caring being the mark of a fan, as opposed to a mere enthusiast, who cares about everything and is insulted by most of it)—especially about a purpose-built attack vehicle like the WRX STI RA, and most especially about a rare purpose-built attack vehicle. 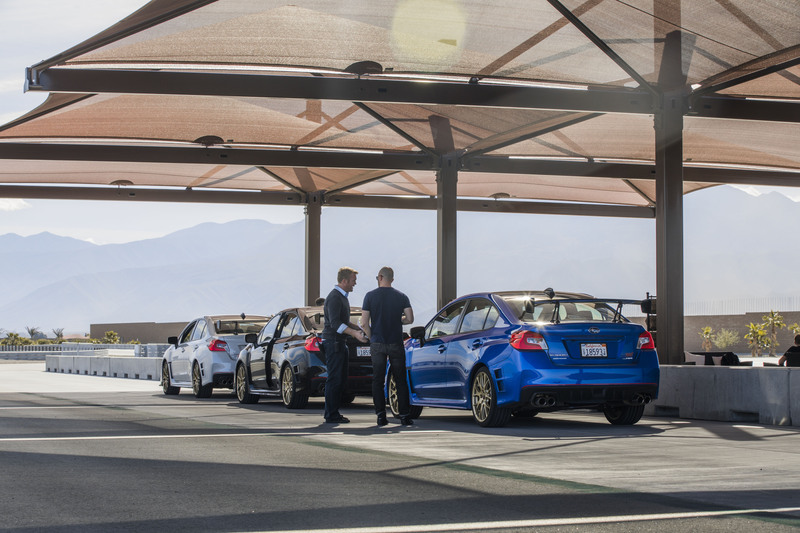 Only 500 examples of the WRX STI RA are coming to North America—in three color options only: WR Blue Pearl, Crystal Black Silica and Crystal White Pearl—and 75 of those are slated for Canada. A numbered plaque above the shifter denotes in which of those 500 you're currently sitting. 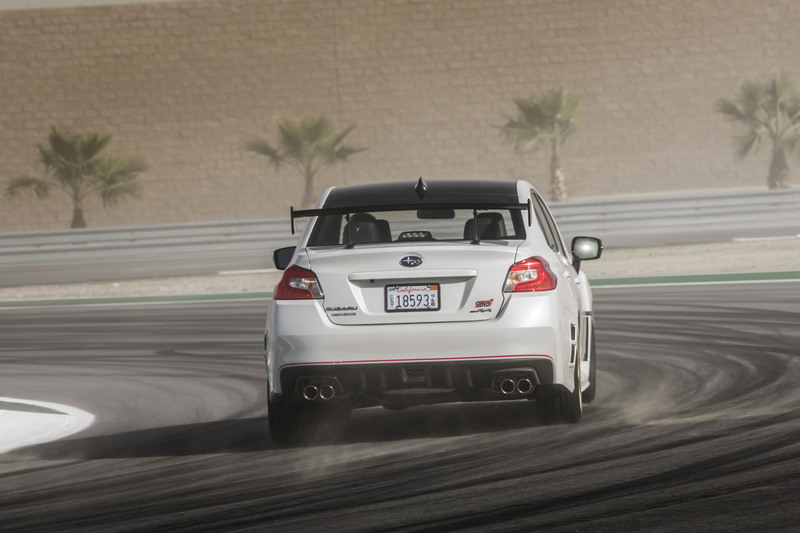 The WRX STI RA is also pricey: at $49,855, it's the most expensive Subaru ever. (That's nearly twice the price of a base WRX, for what it's worth.) 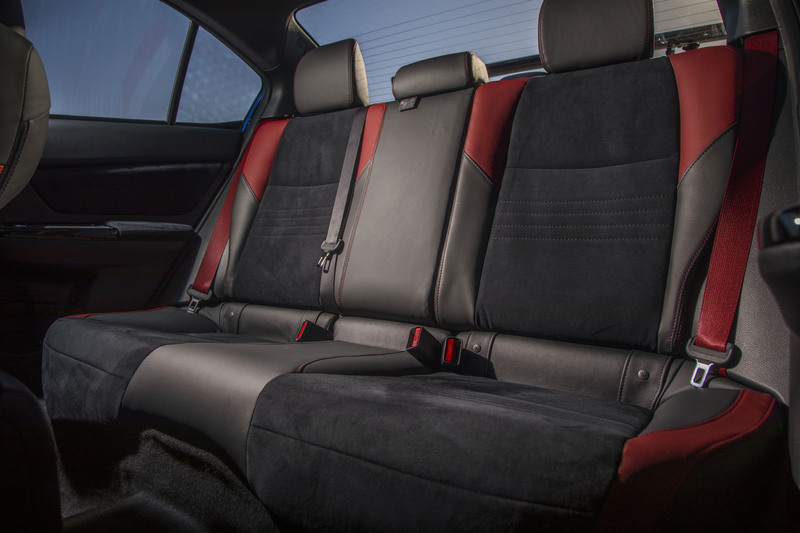 It certainly feels significantly more muscular, more athletic, and more special than the base WRX STI, but whether the whole package is worth $50K is very much a matter of taste. If you think the car is worth it—and I won't argue with you that it is—I'd get in line for one of the 500 now. The Subaru fans, they get it. Worth $49,885? Totally depends what you're into.